“Sometimes when life doesn’t work out as you planned, there is a greater force at work,” said Deanna Kahler in her book From Pain to Parenthood: A Journey Through Miscarriage to Adoption. As is clear from the title, Kahler found meaning in her tragedy through the adoption process, and the family that was formed as a result. For each of the many, many unique women who suffer a miscarriage, there is an equally unique way of coping with this profound loss. Joan Bremer sought to memorialize her own miscarried child through a tattoo. In this way, her son or daughter’s short but impactful life could leave a physical mark to match the one it had left on her soul. 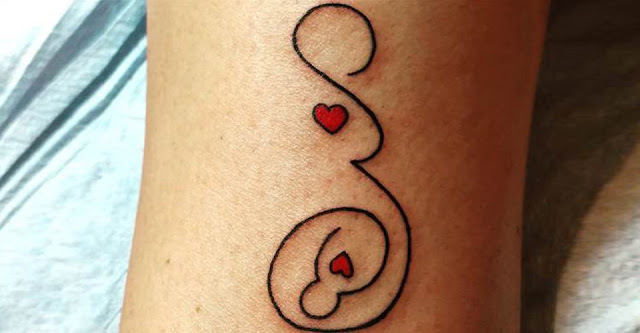 The tattoo Bremer chose is heartfelt and elegant, with a solid black line forming the silhouette of a pregnant mother and the child in her womb. The same line connects the hearts of the two figures. The simple design and powerful meaning behind Bremer’s tattoo quickly captured the attention of women everywhere. Stories began to pour in from women who had suffered similar tragedies, and soon Bremer found herself flooded with love and support. “For me, it was healing to be able to speak about it. I know there is a certain silence about miscarriages and pregnancy losses, but I am not ashamed that this happened to me. That was one of my motivations for getting the tattoo in the first place — I really think it’s healing to be able to talk about it,” said Bremer. Indeed, miscarriage is often among the most silent and private forms of grief one can endure. Rarely does a woman who has lost a child this way feel comfortable sharing her tragedy with the whole world. However, Brember has found a way to do just that by carrying her child’s memory with her in a subtle but visual way. Miscarriage tattoos are quickly gaining in popularity. This surge is due to the general increase in tattoos, especially among women, as well as an increasing amount of openness regarding this type of loss. By opting to memorialize her child in this way, Bremer is not only working through her own grief, but helping other women to do the same. By choosing to grieve her loss in a way that is visual to others, she is making the subject of miscarriage less hushed and taboo. This may, in turn, help another woman who may be struggling to cope with her pain and unsure of how to voice it. “This is so incredibly common, but it’s not a subject that people want to talk about,” Bremer continued. “It happened to us, and it’s happened to countless other people. I want to be able to share and talk about it, and in talking about it move on from the pain and disappointment.” She is not alone. Many women need to talk about their miscarriage in order to work through the pain of the experience, but are afraid to bring it up or unsure of how to do so. When they do, friends and family often don’t know how to react, or fear saying the wrong thing. However, the simple act of listening is often enough.